During this premium webinar you'll learn the fundamentals for adding threat intelligence to your security operations center (SOC). 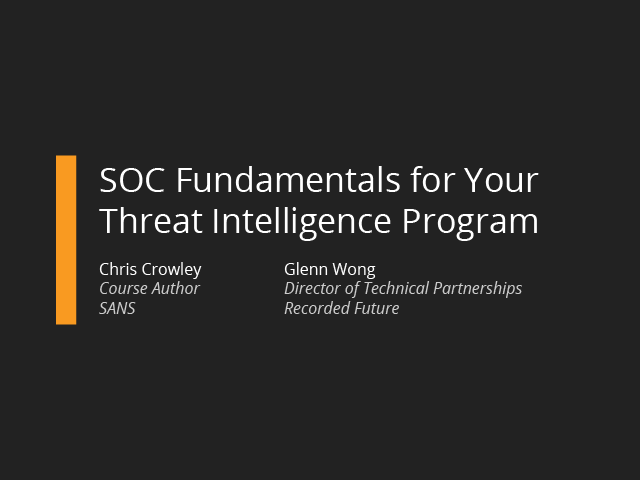 Whether you're just getting started with threat intelligence, or you want to brush up on the basics, this webinar will serve as your guide to setting up and integrating a successful threat intelligence strategy for your SOC. Content is based on the new SANS MGT517 course entitled "Managing Security Operations: Detection, Response, and Intelligence." The number of vulnerabilities in the financial services industry has increased dramatically in recent years. Banks are especially vulnerable due to the large amounts of personal data they store on customers. Knowing quickly which vulnerabilities pose the greatest risk is imperative. • Use vulnerability risk scores for more effective patching. • Track threat actor campaigns and malware variants. • Get a complete view of the financial services threat landscape. Relativity helps over 170,000 users in more than 40 countries to manage large volumes of data and quickly identify key issues during litigation and internal investigations. Relativity's cloud solution, RelativityOne, offers all the functionality of Relativity in a secure and comprehensive SaaS product. To ensure the safety of all its users, Relativity must put intelligence into all aspects of its security infrastructure. • Leveraging threat intelligence in continuous proactive hunting operations. • Correlating vulnerabilities to known exploits for more effective patching. • Building a central team of analysts for proactive searching and collaboration. Hear Allan Liska, senior security architect at Recorded Future, speak on a panel of experts on how to uncover the motivation and mitigation methods for threat actors targeting your organization. Rodrigo Bijou, Senior Manager – Cyber Defense Center (CDC), Gap Inc.
With almost 3,200 stores and more than 150,000 employees worldwide, Gap’s security is incredibly complex. To secure its employees, partners, and customers, the company is drawing together insights from numerous sources of threat data, helping the largest specialty retailer in the United States stay ahead of emerging cyberattacks. • Speed up the investigation of indicators through smarter automation. • Augment workflows in security operations with contextualized threat intelligence. • See gains in productivity as well as greater confidence in security decisions. The intelligence cycle is a process that follows five steps: direction, collection, processing, analysis and production, and dissemination. This cycle was consequential during the Cold War and into much of the early 21st century. But, does it fit into current cybersecurity processes? • Which pieces of the intelligence cycle fit and where. • The three levels of analysis — strategic, operational, and tactical. • How to manage the ever-increasing amounts of data. Hear members of the Insikt Group, Recorded Future’s expert team of researchers, provide their insights on recent dark web trends, current events including threat actor activity, and more. This casual panel offers a unique look into the underground economy and allows you to ask your most pressing questions. Allan Liska is a senior security architect at Recorded Future. With more than 15 years of experience in information security, Allan has helped countless organizations improve their security posture using more effective intelligence. He is the author of “Building an Intelligence-Led Security Program,” among other topics in cybersecurity. Andrei Barysevich is the director of advanced collection at Recorded Future. A native Russian speaker, he specializes in threat intelligence on highly restrictive criminal communities. Andrei was previously a private consultant for the FBI's New York Cybercrime field office and has been involved in multiple high-profile international cases resulting in successful convictions of members of crime syndicates. Juan Andrés Guerrero-Saade (JAGS) is principal security researcher at Recorded Future’s Insikt Group. Previously, he worked at Kaspersky’s GReAT and served as senior cybersecurity and national security advisor to the President of Ecuador. He is the author of “The Ethics and Perils of APT Research: An Unexpected Transition Into Intelligence Brokerage,” among other topics in cybersecurity. New research shows that the job of cybersecurity staffers is getting far more difficult than it was five years ago. Gone are the days when updating A/V software and applying patches were considered "security." Today's security pros need to be concerned with threat intelligence, threat hunting, far more malicious zero-days and state-sponsored attacks. Today's webcast looks at the challenges today's security team faces, the training necessary today to meet those challenges, and the pressures on the infosec team that might not have existed just a few years ago. Recent research from analyst group ESG says that 58 percent of organizations have some kind of threat intelligence program, but a reliance on manual processes and disparate tools means many firms struggle to get real value from the intelligence they have. But, this doesn’t have to be the case. In this webinar, Jon Oltsik, author of the ESG report titled “Operationalizing Threat Intelligence With a Complete Solution” will look at how organizations can better align their threat intelligence capabilities to their pain points and security goals. • Why security operations is harder now than two years ago. • What is needed for a valuable threat intelligence solution. • How to get the most out of your threat intelligence program. Threat intelligence done right gives you a window into the world of your adversary. But with so many types of threat intelligence services and products available, finding the right one to meet your objectives can be challenging. How do you decide which features are must-haves for your organization? • Why it’s not all about sources — context is key. • The advantages of integrating threat intelligence with your other security solutions. • How you can scale your threat intelligence investment over time. • Understanding the threat intelligence lifecycle. • Knowing the difference between data feeds and threat intelligence. • Centralizing, customizing, and collaborating with intelligence. • Integrating with your existing security infrastructure. • Using vulnerability intelligence to power smarter patching. • How the collection and analysis of open source and technical data at unprecedented scale allows proactive decision making. • What humans can do — but beyond human scalability. • Examples of successful threat actor campaigns utilizing AI techniques. There's a common misconception that threat intelligence simply means feeds of indicators just for SOCs or high-level reports only useful to security leaders. The fact is threat intelligence can be a valuable weapon in every part of your information security strategy. In this webinar, we'll take a close look at five different roles generally found within information security organizations: vulnerability management, incident response, security operations, threat analysis, and CISOs. Discover what specific processes and responsibilities are found in each team and how threat intelligence can be integrated into each to improve accuracy and reduce time to action. We’ve talked in previous webcasts about what threat intelligence is and how to use it. We complete this series by taking a look forward – what we can expect from the threat intelligence technology and how it will play a part in a company’s overall information security strategy. There are a variety of threat intelligence feeds and services on the market to keep IT organizations up to date on the latest security threats. But many organizations fall short in operationalizing threat intelligence and using it to enhance the effectiveness of their existing security tools. Recorded Future integrates with IBM's QRadar, Resilient, i2, and X-Force Exchange, so regardless of which part of the IBM Security technology stack you use, getting threat intelligence enrichment collected from open, closed, and technical sources is easily automated. Unlike common open source IP or domain reputation lists, Recorded Future's risk lists include rich context so you can make decisions quickly about suspicious activity and can take action quickly. • Rapidly understand true incidents in context. • Develop processes to quickly analyze and digest threat data. • Use threat intelligence when it counts most: BEFORE attacks hit. Security operations center (SOC) teams are continually faced with new alerts and events. Security information and event management (SIEM) solutions such as Splunk help by making it easier to collect and analyze data generated by your technology infrastructure, security systems, and business applications. However, working with this volume of data risks SOCs being overloaded and rapidly available and readable information is vital to prioritize how you respond. • Alleviate alert fatigue and speed decision making with machine and human-analyzed threat context. • Identify threats already in your system by correlating network traffic with known bad from outside your network. • Get a live walkthrough of how to utilize real-time threat intelligence in Splunk Enterprise. Recent Recorded Future research has uncovered financial services insiders selling their services to threat actors in criminal and dark web forums. You may already be managing and monitoring access to critical systems and data in an effort to secure against insider threats, but external threat intelligence has a role to play in identifying potential rogue employees and their targets. • Expose threat actors in underground forums and criminal marketplaces. • Monitor for breaches by insiders on paste sites, forums, or code repositories. • Detect early indications of insider threats, as well as breaches resulting from their actions. A wide range of threat intelligence feeds and services have cropped up to keep IT organizations up to date on the latest security threats. But without mechanisms in place to actually use the information, these alerts provide little benefit. • Identify the threat intelligence sources most valuable — and least valuable — to your security efforts. • Use threat intelligence when it counts most: BEFORE the attack hits. In an age where threats are increasingly orchestrated to target specific organizations, industries, and technologies, a much greater emphasis needs to be on understanding the mind and methods of an attacker. Gathering and applying relevant intelligence has never been more important, but with so much threat data and so little context available, how is it possible to be confident that you will know and understand the risks that you face, and can proactively defend against them? In this webinar we’ll explain what you can learn by gathering data from varied sources to uncover threat intelligence that’s truly relevant to you. • Combinations of factors that result in relevant intelligence. • Examples of how threats target particular industries or technologies. • How intelligence can be applied for proactive defense. • How to get the best actionable data from your logs. Threat intelligence is one of the most talked about areas of information security today. Vendors, service providers, consultants and integrators are all looking to find ways to use threat intelligence to help businesses apply what we can learn about emerging cyber-threats and their tactics to protect valuable data and systems. However, when it comes to applying these types of services/products, it can be hard to know where to start, whilst establishing what types of threat intelligence will prove truly beneficial to your organization is also a challenge. Headlines as we left 2016 and predictions for 2017 suggest that the future of the IT department (including information security) looks to be increasingly reliant upon machines doing the work, courtesy of the adoption and explosion of automation technologies, artificial intelligence and machine learning. How capable can machines ultimately become in securing businesses from an increasing array of threats? What role does this leave for humans? In this webinar we will look at the rise in popularity of artificial intelligence generally, what it means for businesses and its potential to improve efficiency and security. Which areas of security strategy may have the most to gain and lose in this transformation? Recorded Future arms security teams with threat intelligence powered by patented machine learning to lower risk. Our technology automatically collects and analyzes information from an unrivaled breadth of sources and provides invaluable context that’s delivered in real time and packaged for human analysis or instant integration with existing security technology.